Eckhart Tolle has become quite visible as one of the most gifted and inspiring spiritual teachers of the early 21st century. 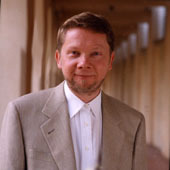 Born in Germany, Tolle spent the first 13 years of his life there and then left for England, graduating from the University of London. After graduation, while working as a research scholar, Tolle experienced a profound spiritual transformation. This was such an intense experience that Tolle claims the man he once was is nearly unrecognizable to himself today. In the following years, Tolle devoted his life to a rigorous inward journey. This led to work with individuals and small groups as a counselor and eventually to the spiritual teacher he is today. Tolle's simple yet profound teachings have helped thousands of people find an inner sense of peace and greater fulfillment in their lives. What Eckhart Tolle hopes his teachings will accomplish is a spiritual awakening on a global scale. Tolle resides in Vancouver and is currently working on a new book. The place to begin with Eckhart Tolle is definitely by listening to "The Power Of Now" which he narrates. Tolle asks you to leave your analytical mind and with it, the ego, at the door. Underlying everything and in between words is a stillness and peace that can only be attained in the present moment. This is the first place to learn about Tolle's philosophy and it has grown steadily in its popularity since first publications. Next up is "Stillness Speaks"; here Eckhart shows you how to be with another in a relationship that can contain and weather all things, how to sit with a dying person, where to find wisdom, and how to free yourself from guilt. Finally there's "Even The Sun Will Die", an interview conducted on September 11th. As the days events unfold in real time, Tolle responds with a calm and clear voice that makes sense of the chaos that will forever define 9/11. If you are feeling bombarded by a chaotic world of uncontrolled emotions and feelings, Eckhart Tolle can offer solutions and lead you to a peace you never thought possible. LearnOutLoud.com is the best gateway for Tolle's audio programs to help you find the power of now. One of today's most influential spiritual teachers shares his youthful experience of depression and despair — suffering that led him to his own spiritual breakthrough, and ultimately, freedom and peace of mind. Zencast is a soothing transmission of peaceful music combined with inspiring Buddhist Dharma talks. A good book is best shared with friends. Watch webcasts with Oprah's favorite authors and discuss the latest Oprah's Book Club selection. When Eckhart Tolle agreed to be interviewed on September 11, 2001, he could not foresee the historic nature of this date or the suffering that would follow.